All things considered, 1983 was something to behold. Motorola introduced the first mobile phone to the general public. Swatch watches became a thing. Sally Ride became the first American woman in space as a crew member of the space shuttle Challenger. The series finale of M.A.S.H. drew 125 million viewers. “Risky Business” was a smash hit. On a local level, Terry Goddard became both the first Democratic mayor of Phoenix in 35 years, as well as the youngest mayor ever elected in Phoenix (age 36). The Phoenix Suns hit the playoffs for their sixth consecutive season. A group of local investors launched America West Airlines. 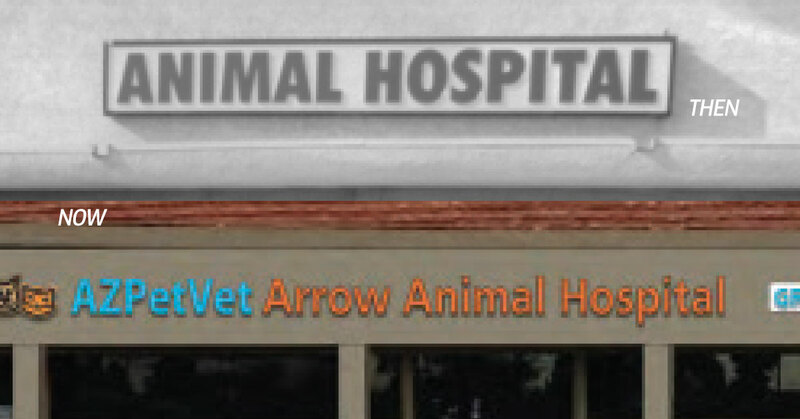 And Arrow Animal Hospital opened its doors in Glendale. From its humble beginnings as a two-doc shop, Arrow Animal Hospital grew to become a trusted Glendale community resource for families with pets. As new sister hospitals opened around Glendale and eventually other parts of the Valley, the group of locally-owned and -operated hospitals were given a brand name that connects them all – AZPetVet. Today, the AZPetVet family includes 21 animal hospitals around the Valley, open 7 days a week. Each location provides routine wellness to medical, dental, surgical and emergency services. Within the AZPetVet family, there are also veterinarians experienced in the treatment of chronic diseases, as well as for exotic animals, pocket pets, reptiles and more. AZPetVet has been a very supportive member of the community, promoting and sponsoring nonprofits like Gabriel’s Angels, which provides pet therapy to more than 14,000 at-risk children around Arizona; Grandpaw’s Pantry and Helping Hands for Homeless Hounds. AZPetVet clients can save a lot of money over the years with exclusive programs like FREE Vaccines for Life. For less than $100 investment, core vaccines for cats and dogs are free annually for the life of the pet, and program membership is easily transferred to any of the 21 AZPetVet locations around the Valley. Since unexpected emergencies can happen, another way they help pet parents is by offering generous no-interest payment plans. AZPetVet Arrow Animal Hospital is well underway – a facility that will more than double their current footprint and capacity, including expanded urgent care capabilities and a even a cat suite!